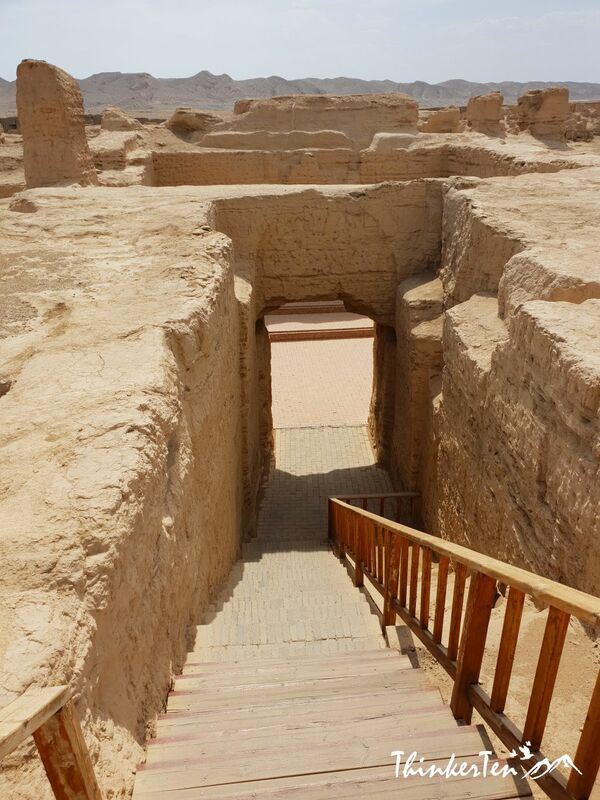 Jiaohe Ruins is one of the important archaeological site in Yarnaz Valley, 10 km west of Turpan in Xinjiang China. 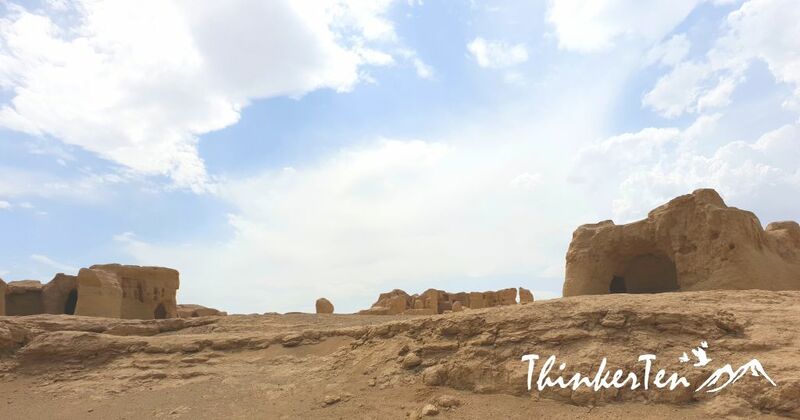 The ruins are located along the Silk Road and best preserved ancient city in the world, a Unesco World Heritage Site. 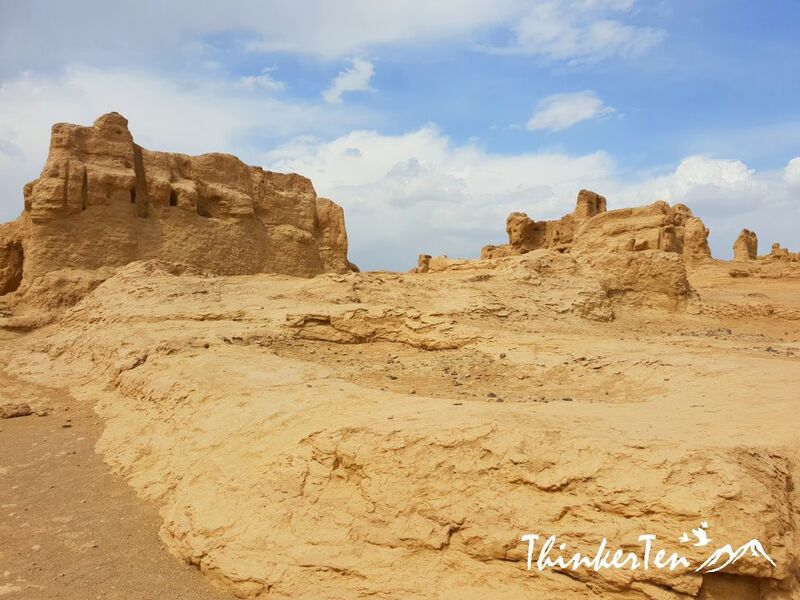 If you are in Xinjiang, this would be the number ONE must visit place! 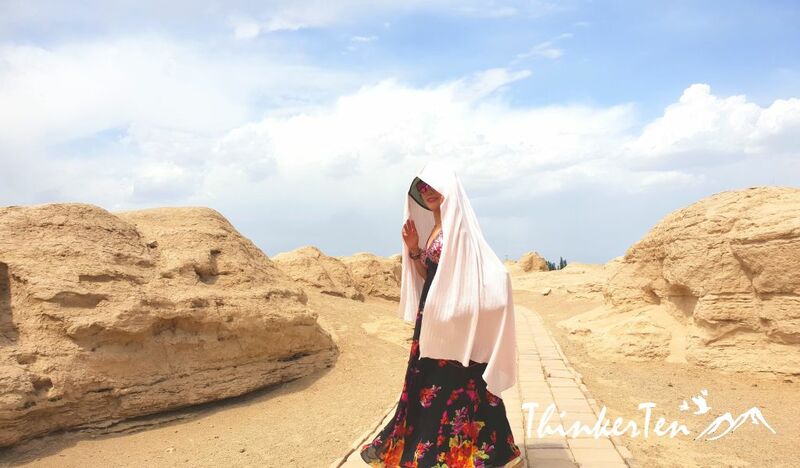 You can do Karez Well and Jiaohe as both are located nearby at the west of Turpan. 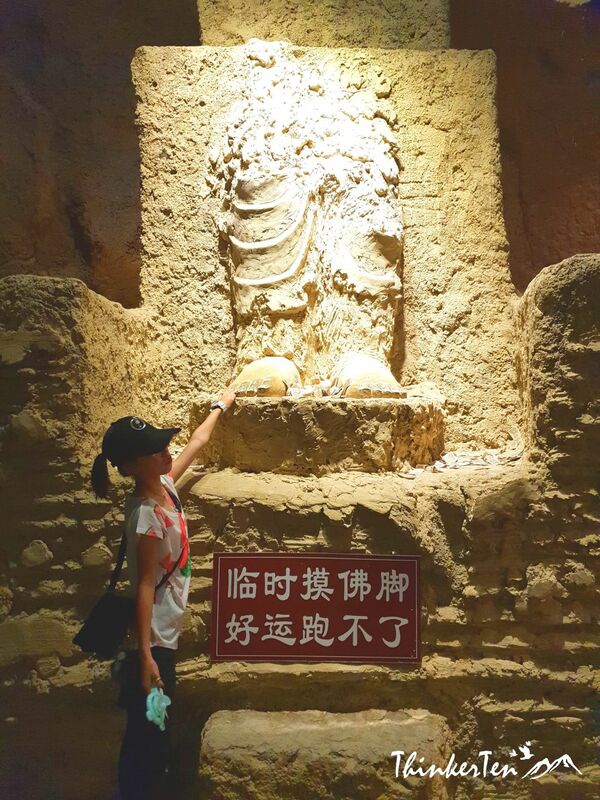 There is a little museum before entering to Jiaohe Ruins. You can listen to the short video introduction of Jiaohe in Mandarin only and subtitles in English. 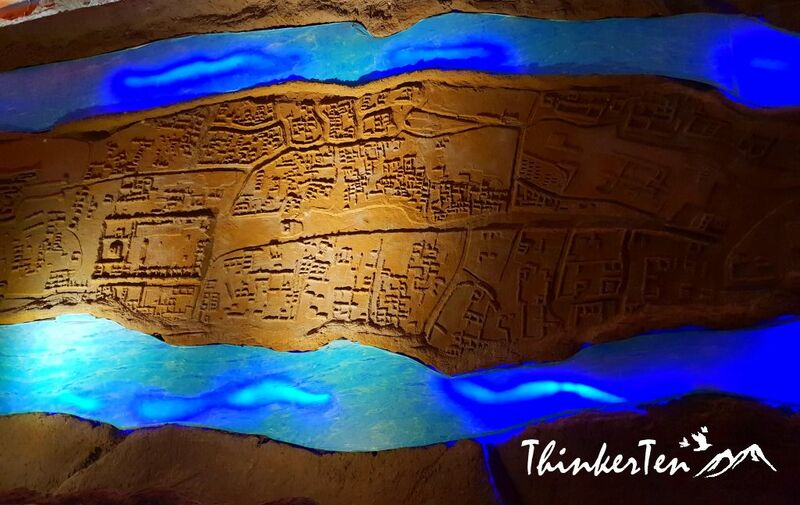 There is a model showing Jiaohe strategic location on top of the hill surrounded by a river. 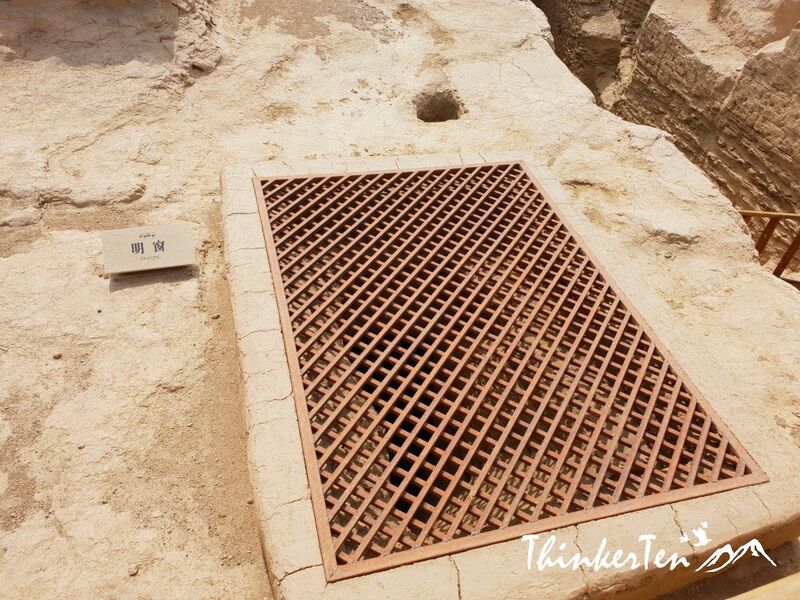 When you entering the Jiaohe ruins, you would feel the excruciating heat from this area. Not sure how the ancient people survive back then? Bring along umbrella and water, wear a hat, sunglasses and apply sunscreen before you stepped food at these ruins. Anyone who read Chinese will know Jiaohe mean where two rivers meet. It is the oldest and largest earthen cities which were built 2,300 years ago. As you know the ancient city usually has a city wall. However, there are no city walls for this ancient city if you try to look around. It is better to come here with a knowledgeable guide so you can understand what these ruins were used for, eg Government office, residents or Buddhist temples. If you don’t have a guide, you may want to listen well to the intro at Jiaohe museum. There is also small signboard telling what these ruins are for. All the buildings here were constructed out of the earth, look like the Tatooine city in Star Wars. 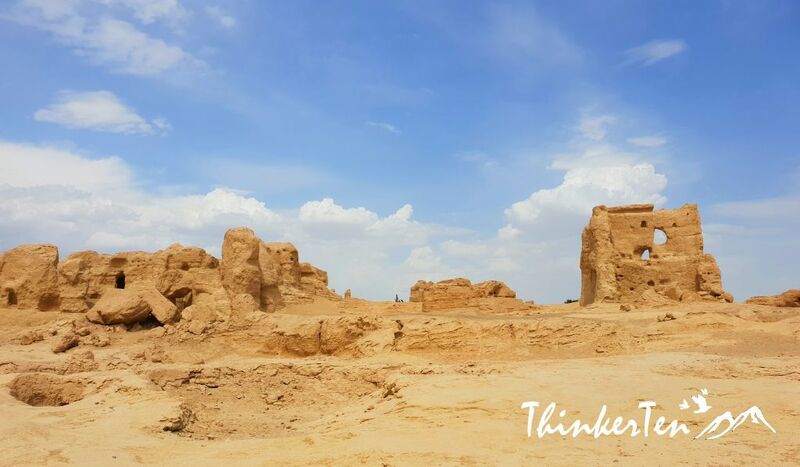 Jiaohe ruins used to have a population of 7,000 and it is located at a very important crossroads of Silk Road for ancient merchants to do their business here. I have seen few ruins in other parts of the world but none as a complete set as this one here. 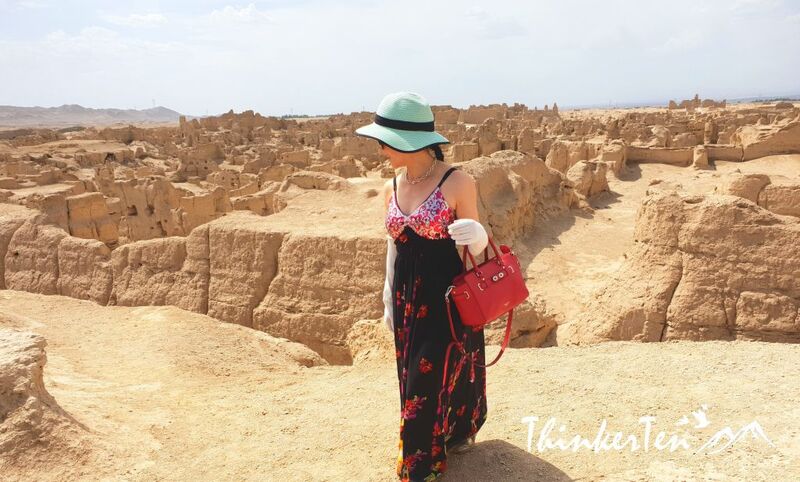 Jiaohe Ruins is vast! As I said, Jiaohe Ruins are really huge, you need at least a minimum of 2 hours to explore the whole area. There is plenty of walking but good walking path was done for the tourists, so it is very easy to walk. Don’t step out from the walking path as you may damage the ruins. NO shelter in this area, so brings along an umbrella or big scarf to protect you from the sun. 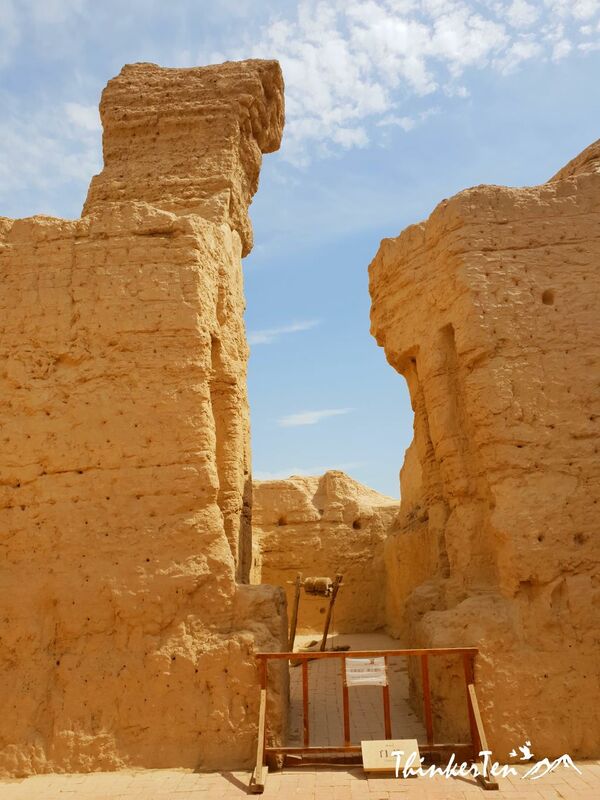 Stupa Grove – it marks Xinjiang’s earliest stupas. Great Monastery – there were several monasteries in Jiaohe and also the city largest. Government Offices – this is dug underground so we walked down with stairs to check out the layout of the courtyard. Residential Area – Most of the houses were carved out of the ground. When you are done, enjoy the melons outside! 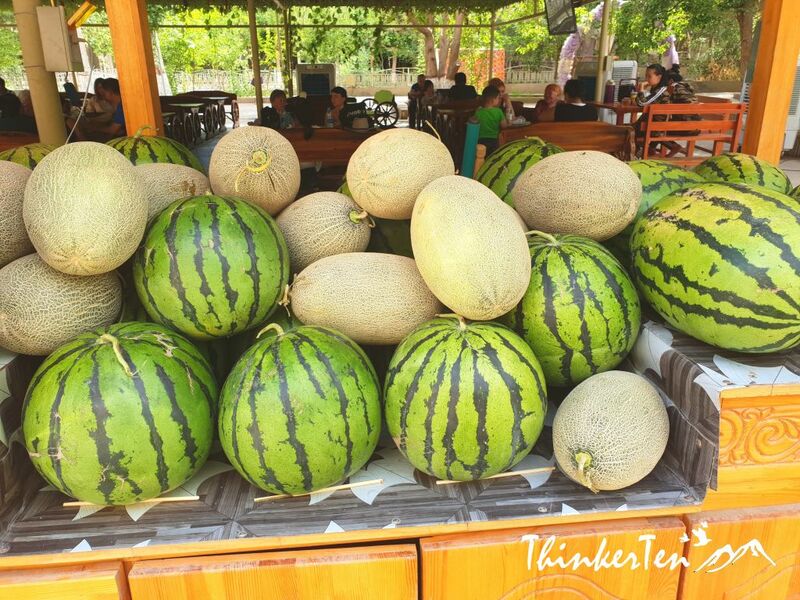 There are huge watermelons and hami melon selling at the resting area once you are done with Jiaohe Ruins. I didn’t get any of the melons as I was concerned with their hygiene. I finished 2 bottles of drinks from the stall instead. Yes, I was so thirsty after hours of pretending to be an archeologist. We were here in the summer, also the hottest season of the year. You could not believe how hot it was, just like inside an oven! 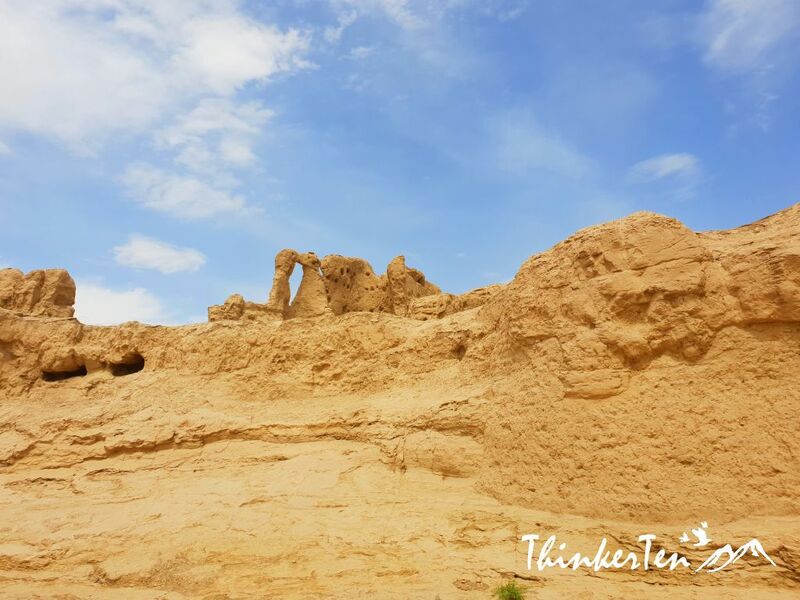 Bring along water to explore Jiaohe Ruins, you definitely need it half way. The good thing about coming in the summer is less crowded, that way better photo opportunities with no photo bombs. 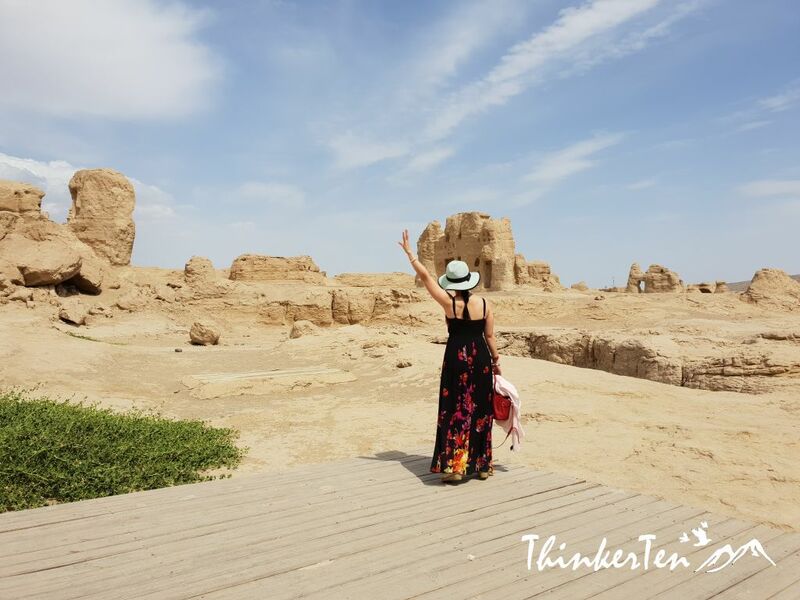 This is a remarkable site along ancient Silk Road and you cannot miss this world largest and most well-maintained ruins! If you dont like holding umbrella, another option is to use a big scarf to cover. And you can also hang it on your neck so it is not much of a trouble. 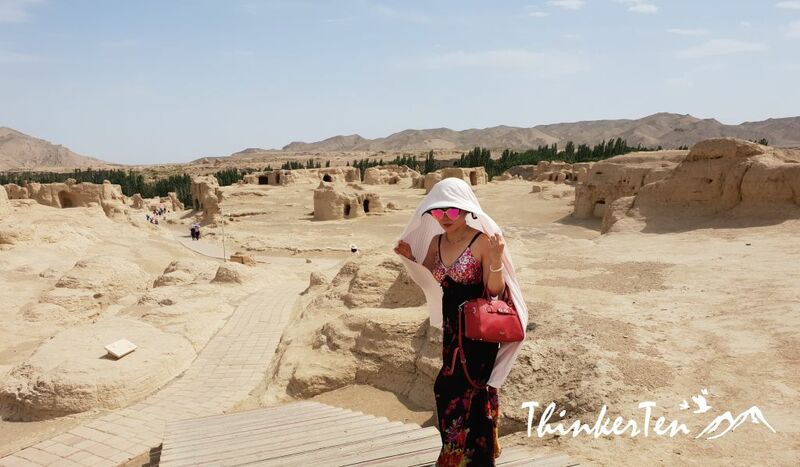 Furthermore the weather in Jiaohe Ruins is very dry, not so much of humidity so scarf is very ideal to block the sun. That’s why you see the desert people in the middle east usually use big scarf to cover their face. These ruins look nice and HOT, I can see why you would encourage other to bring along an umbrella, water, hat and so on. A tip I’ll be sure to follow if I visit Jiaohe. 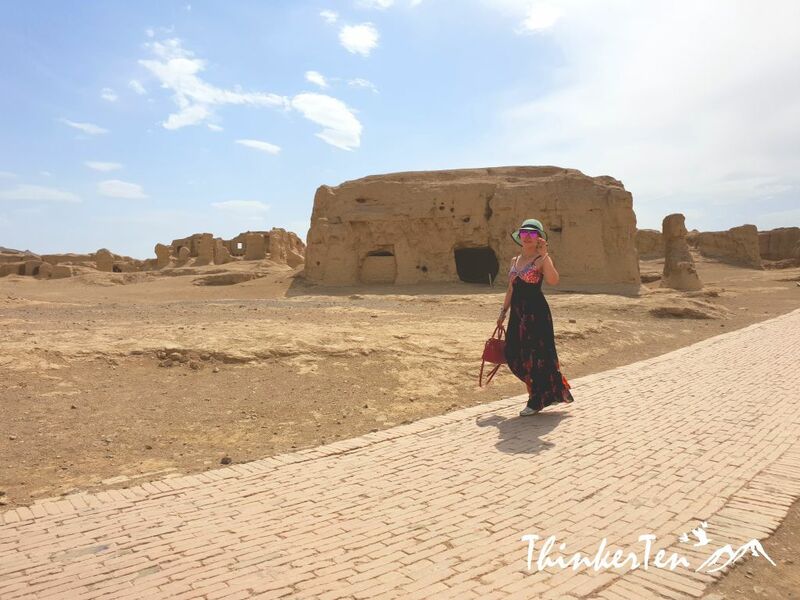 If you ask me to describe the heat in Jiaohe Ruins, I would relate it to an oven and the visitors are the walking cookies. This is the desert land and the air we breath in is super dry. It was about 50 to 60’c during my visit in June summer. The one thing you should not forget is the water bottles. You may need more than 1 bottles of water if you wanted to explore the whole ruins which can take up more than 2 hours. China is such a wonderful place. Love to visit there one day. Truly a bucket list material. China is full of history and culture. This part of China is at the northern part called Xinjiang, even the ethnic people who lives here look different from normal Han Chinese. This part of China usually for advance traveller who have been to China several times. Wow! It is all so gorgeous and interesting, Such an amazing place to explore. Among all the ancient earth houses of the world, Jiaohe ruins is one of the best preserved. If you look at the landscape, it is pretty interesting to see the whole land is covered by earth buildings. Such a gorgeous landscape. This is amazing! I’m a big history buff, so I would love to visit this place! If you love history, this is the place for you to explore. 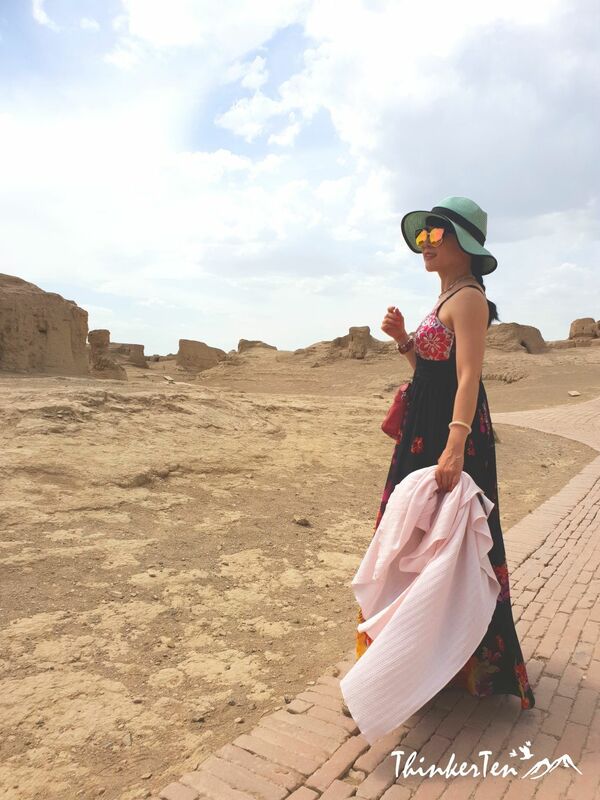 Walk like an archaeologist for few hours and post as many pictures as possible like a supermodel 🙂 in this few thousand years old ruins – Jiaohe ! Wow, that is such an amazing place to visit and I do love knowing the story behind of my visited places. These sites look amazing! I bet their even more beautiful in person..
You need to see it yourself to experience the oven heat! Then close your eyes and imagine how ancient people live in such environment! I doubt I can survive one day! Lol. Wow, what a fun trip! I’d love to visit China when my kiddos are older. China is fun and full of history. Kids needed to be a bit older then only they can appreciate and understand the culture and history in China. As I was reading through I was formulating a comment in my head and I was going to comment about how it could almost be the set of Star Wars and then you put it! I would love to travel the area with the guide to tell me all the different things that I would probably miss if I went by myself. Before reading this post, I had no idea these ruins existed – just never heard of them before. They look fascinating and no wonder they got UNESCO World Heritage Site status. Would love to see it for myself one day. Lovely photos. The ancient city of Jiaohe is the world’s architectural wonders. Very hot to explore the site especially during summer. There are many shelters for visitors to take a rest. Be prepared to sun bathe for few hours as the ruins site are so big. What is amazing place to visit! I just love exploring old cities and learning about their history. Such well maintain ruins are really rare these day and also the world largest. This is really cool! It is rare to see even photos of this part of China! Looks an amazing place…great presentation.. I would enjoy exploring the Jiaohe Ruins. I also think it’s worthwhile hiring a guide. For me, it’s much more interesting when you can learn the history. Thanks for your comment. 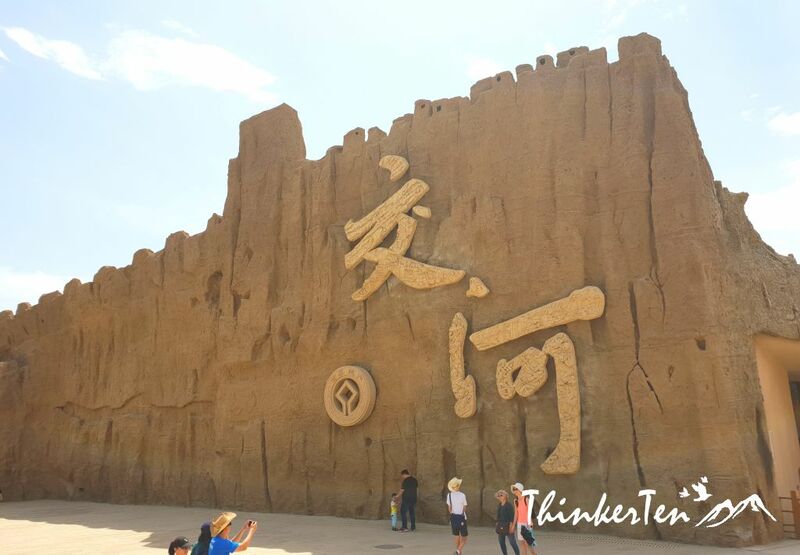 There are only simple signboard in Jiaohe ruins so getting an expert guide is also a plus and make your trip more fun as you get to learn about the history. This place looks amazing! I would love to visit here one day, it seems to have so much history and story to offer. Thanks for sharing! 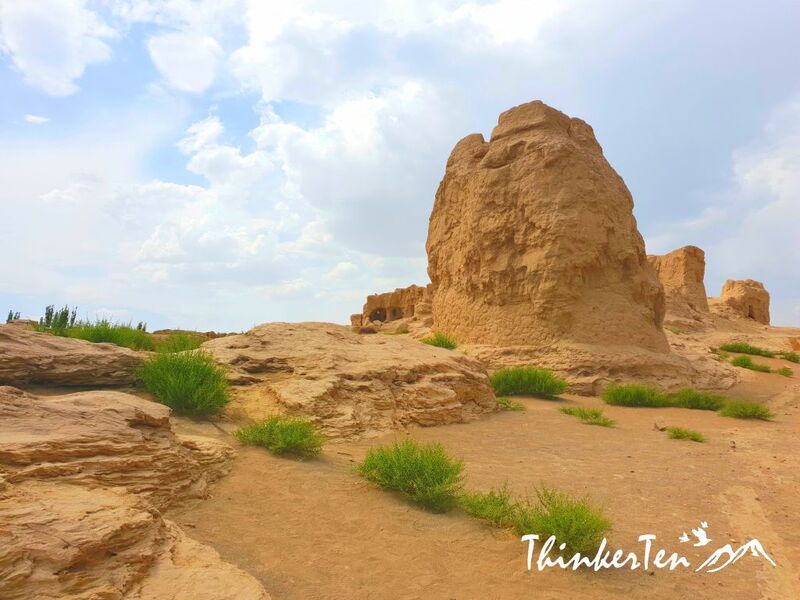 Jiaohe Ruins located not very far from Turpan City. This is one of the must see, a Unesco World Heritage site 2000 years old. The ruins are just incredibly huge, the whole town is literally a earthen ruins! Quite an amazing site to see! Haha, I have fun exploring like a pretending archaeologist, supervising the site for few hours and I was burned!! How come there is no shade?? I wonder why!! WOW! Such an incredible place to visit, I would love to visit China one day. My husband would flip out if he got to go check this out. He loves this kind of stuff. I love places like this. It’s great to learn and see so much history! I love history too, it provide us with an insight into our cultures of origin. I guess it also important because it tell us how much we have evolved. This place is uniquely amazing… I wanna go to silk road too! Wish I could be there one day.. When you consider how old the ruins are, it’s absolutely amazing that they are still available to visit. I would love to go back through time to see them. It looks incredibly hot there. It was great advice about taking water. It seems like such an incredible place to explore though. Wow – that looks like such a great place to visit. I love all the wall art. Yes, these place is like an art to me. All the houses and buildings back few thousand years ago look like some kind of masterpiece of ingenious ancient people. What an amazing place to explore! So much history and intrigue behind seemingly every place. I would love to add China to my Must See list . . .
WoW! A truly spectacular, rich in their heritage and history. A definitely great place to visit for learning, exploration and fun! Wow, it is incredibly beautiful there. I definitely want to visit when I can, I am bookmarking this for when I do make it there. BTW, you have such gorgeous pics!